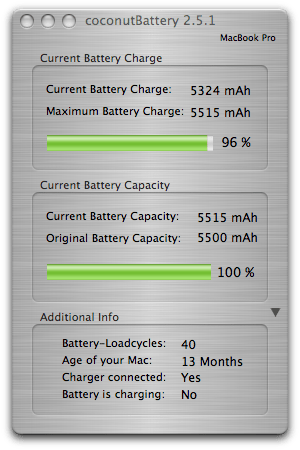 Good thing I didn’t replace my Mac Book Pro battery after all. My battery: Better, stronger, faster than ever before. Seriously, I do seem to have more time off the power adapter. If I make the monitor really dim, I can get around 2.5 hours on a full charge. The difference between now and then? Apple’s Battery Update 1.3. I guess it worked. I think you posted about batter problems on twitter. I’m glad you got it corrected. Just wanted to let you know that you’ve been tagged.